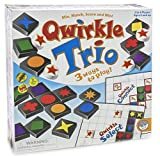 Qwirkle Select adds an extra element of strategy to Qwirkle with powerful star tokens that allow you to take a tile off the board and add it to your hand Qwirkle Select is a part of Qwirkle Trio. Use the blue side of the boards. Arrange the game board quadrants to make one large square playing board. Put the quadrants together so the four thickbordered squares are in the center of the board. Place a star token on each of the star spaces. The player with the most tiles that share one attribute plays first and he/she must place a tile on one of the four squares in the center of the board. When you play a tile on a star space, take the star token from that space. You can use the star token on one of your subsequent turns to improve your hand. It is important that you can only use a star token on your turn, not on someone else's turn. When using a token, play the token at the beginning of your turn. You can only use one star token per turn. When used, the star token allows you to take a tile from the board and add it to your hand. 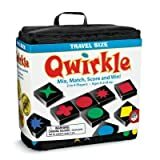 You can take any tile on the board EXCEPT a tile that is part of a Qwirkle. 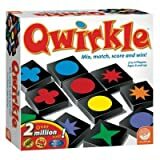 Pay close attention to the board and your hand - you might be able to get the tile you need to make a Qwirkle. After using a star token, your turn continues normally. At the end of your turn, draw your hand back up to exactly six tiles. You cannot play off of the board. Note: When you use a star token to remove a tile from the board, some tiles may become disconnected from the rest of the tiles. Players should continue to place tiles on any legal space, including off of the disconnected tiles. A player used a star token to remove the yellow diamond from the board and add it to their hand. The player then played the yellow diamond tile with two other diamond tiles to score 7 points. The player also earned a star token by playing the green diamond on a star space. Notice that all the tiles are no longer connected. All of the tiles can continue to beplayed off of even though they are not all connected to each other. Some tiles were disconnected while other tiles were reconnected when a player used a star token to remove the orange square from one area of the board and make an orange Qwirkle elsewhere on the board. The star space in the lower left part of the board was previously covered. You do not get a star token when playing on a star space that no longer has a star token on it.